In 2015, there was a big change for Sivantos Group, the parent company of some of the most popular hearing aid brands on the market (Siemens, Audio Service, Rexton, A&M). With over 100 years of experience, Sivantos Group launched the new brand Signia, co-branding with its innovative Siemens brand. With a focus on forward thinking and customer-centered, quality-driven values, Signia introduced its first hearing aid: Primax. Primax builds upon the technology and successes of its predecessors, with brand new features and innovations. Signia Silk has revolutionized not just completely-in-canal (CIC) hearing aids, but also the experience of being fitted for hearing aids. Primax is poised to be the most advanced technology to date from Signia/Siemens. Building upon the groundbreaking technology of the Siemens binax, Primax combines the power of outperforming normal hearing in challenging noise situations and a brand new platform that has clinically proven to reduce listening effort for the wearer. In 2015, a study from University of Northern Colorado performed speech testing with participants wearing Primax hearing aids. Participants in the study reported a significant reduction in listening effort, and a natural listening experience. The study identified two main Primax features as instrumental in this success: SpeechMaster and EchoShield. With hearing loss, one of the chief complaints is that people are able to hear, but they do not understand. This is due to the difficulties of speech recognition that is present in hearing loss. Depending on the listening environment, background noise may interfere with conversation and speakers’ voices, making it difficult for those with hearing loss to find clarity of sound. Primax’s SpeechMaster feature consists of three technologies to tackle the issue of speech recognition: noise reduction, directionality, and steering amplification to focus on sounds the wearer prefers to hear. SpeechMaster provides Primax wearers with flexibility to focus on sounds they want to hear, while eliminating the distractions of background noise. SoundSmoothing assists this process by softening the sharper, louder sounds one may experience with speech. Improved speech recognition enhances the listening experience for Primax wearers. Those with hearing loss will understand the difficulty of taking in sounds from your environment – especially in cavernous acoustic spaces. For example, a conversation in a lobby or atrium may pose or of a difficulty in a small office. Lecture halls, places of worships, auditoriums, hallways – these all pose a challenge of echoing noise. Primax hearing aids offer a brand new feature, EchoShield, to address the issue of degraded sound within these difficult spaces. EchoShield eliminates reverberations and protects the sounds Primax wearers want to hear. At the same time, EchoShield softens and balances loud, reflected sounds to prevent over-amplification, which provides Primax wearers with a comfortable listening experience. Primax offers music lovers the HD Music feature, a program with three settings to enhance the experience of listening to music. “Recorded Music” is for listening at home or in the car; “Live Music” for concerts both indoor and out; and “Musician” for those who work in the music industry or play music, whether amateur or professional. 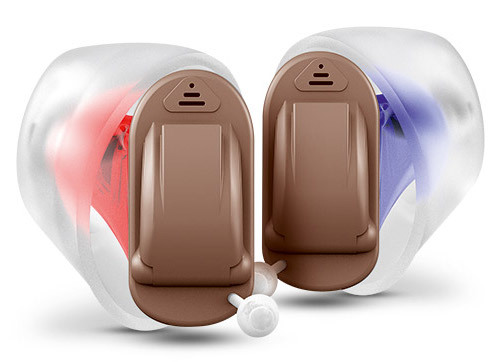 Primax is a fully digital and wireless hearing aid, with the option to connect to your smartphone and other personal electronic devices, through the TwinPhone feature. Twin-Phone is a hands-free option that uses a magnetic connection to give you access to programs on your phone. Primax hearing aid wearers have the ability to stream phone calls directly to their ears, which helps to prevent feedback that would otherwise muddle the listening experience. Primax wearers may make adjustments and changes to the volume and programs through the easyTek app and the touchControl apps, downloadable to their smartphones or other devices. Primax hearing aids are available in receiver-in-canal, behind-the-ear, or in-the-ear wearing styles. Designed to treat varying degrees of hearing loss, Primax is available in 7px, 5px, and 3px performance levels. The Primax is available in the following styles: Ace Primax, Pure Primax RIC, Motion Primax standard BTE, and Insio Primax ITE. Primax also treats single-sided hearing loss with CROS/BiCROS hearing aid styles.